Do you lean towards the clean Modern lines? When the creative team at Sew4Home saw this line they immediately knew of the perfect projects that inspire all of us for the perfect Vintage Modern kitchen ensemble. 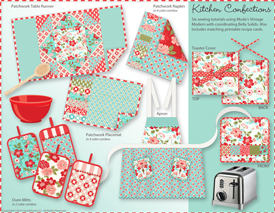 Vintage Modern is headed to stores in May, so mark your calender for May 14 and follow along every day for tutorials, patterns and tips to whip up these fresh new accessories for your kitchen. Friday 5/26 Great Giveaway- of course it will included Vintage Modern fabrics! International Quilt Market in Kansas City, May 18-20th. I LOVE the colors, and those pot mitts look so cute! I can see that I’ll be checking in regularly! That looks like a lot of fun. I absolutely love red and turqouise colors together and LOVE her fabrics. Love the colors and I can’t wait foir the projects.